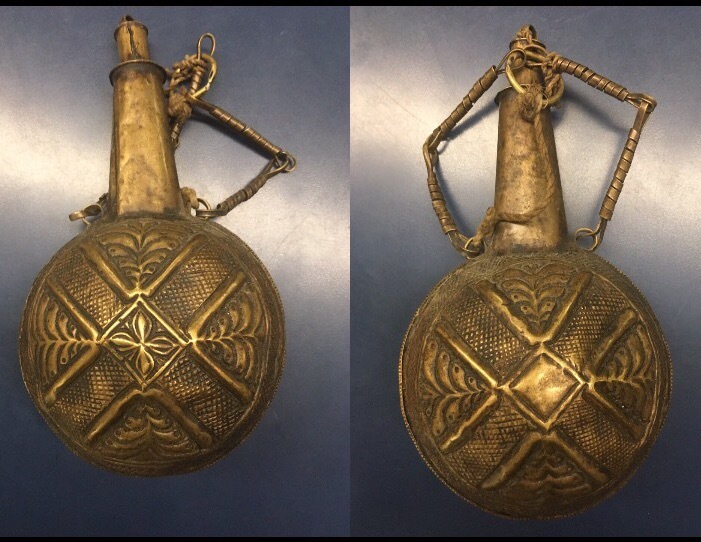 Need help identifying this powder flask. I thought perhaps Indo-Persian? Unsure of the year as well, or if it's even authentic. It was purchased 3 years ago at a gun show. The seller said it was "really old" and Moorish. Any help is much appreciated. Powder flasks were made in an almost infinite variety. That, alone, makes it difficult to ID them unless they are US Martial, English or of another origin which followed patterns. It does not appear to be European. My guess would be North African or Middle Eastern, although Indo-Persian might work as well. There is also the possibility that it is relatively modern and made for sale to tourists. In Turkey and the surrounding area there is an industry which turns out a lot of flintlock pistols, blunderbusses, etc. for the tourist trade. They are fairly easily ID'd because of the mediocre workmanship and strange decorations. They are artificially aged. One thing about your flask which makes me think that it is something associated with this industry is the uneven decoration on one side. It just does not look right. The workmanship is a little funky. 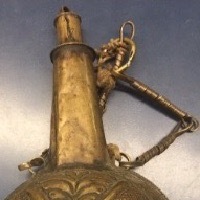 I don't think it is Moorish because the Moors were noted for their beautiful geometric designs and your flask does not really have the quality designs that they produced. While there are a lot of collectors of antique flasks and horns, the market is by no means as large as the one for guns. 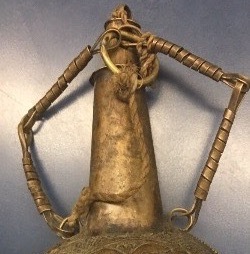 Many people obtain flasks and horns to display with their guns but are not serious collectors. Consequently, there is not a lot of literature on these things. Perhaps someone else on the forum can respond and perhaps pin it down for you. Best of luck.